Porcelain angels are easy to find in the dollar store or craft store, but many of them need a fashion makeover. 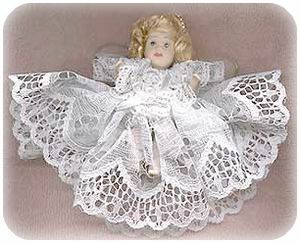 Here’s how to dress a porcelain angel in lovely white lace, using your glue gun, rather than the sewing machine. I purchased the porcelain doll at a local dollar store. It is a complete doll with porcelain body, arms, legs and head. She was dressed, but not very nicely. I removed all of her clothes and measured the waist area. Then, cut a piece of gathered lace the length of her waist plus &frac12 inch. Feed a piece of wire through the gather of the lace, wrap around the doll’s waist and twist the wire with pliers to secure. Secure the lace seam at the back with a little glue. I did the same for the neck area, using a lace smaller in width than the lace used for the skirt. This creates a skirt and top for the doll. Apply a small dot of glue to the front center top and back center top to keep the lace from exposing the doll chest and back. Glue a small ribbon bow to the front center of the doll, glue a gold ring to the doll head for a halo and glue angel wings to the back of the doll. On top of your wings, glue a gold filigree and then on top of the filigree, glue a small ribbon bow (see photo of back of doll). These are beautiful little dolls that make wonderful ornaments or add them to gift packages as an extra wee gift and decoration.